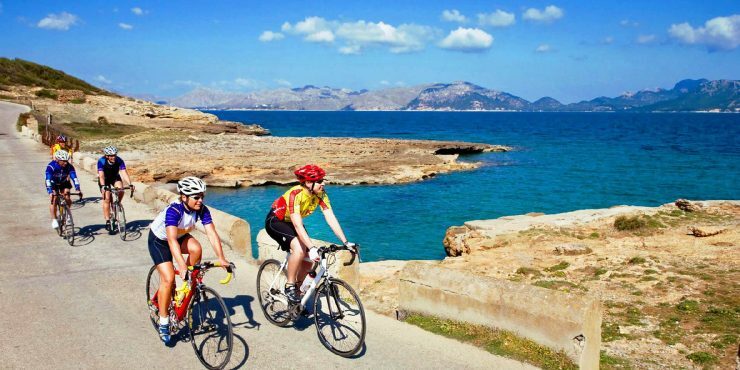 Ibiza’s mild winter and spring climate and welcoming warmth of the people are just a few reasons cyclists love to take their cycling holidays in Ibiza. Cycling routes in Ibiza are diverse, and are good for cyclists of most levels, from healthy novices to advanced riding. The routes traverse plains along the beach and countryside and steep terrain in the hills. Ample cycling opportunities exist on secondary and country roads as well as on paths and rural routes. The island is popular for professional european teams that arrive to Ibiza eager to train with good weather just a couple of hours away from home. Another benefit of Ibiza is that you can enjoy superb food and wine along your route. While the weather is good year-round, we would suggest you to avoid peak season and organize your holidays from October to May. Balearic.bike is a company committed to seeking out the very best cycling experience in Ibiza, a perfect organization offering you private transfers, high performance bikes, top boutique hotels and culinary experiences. Every step is designed to make your cycling tour of Ibiza unforgettable.